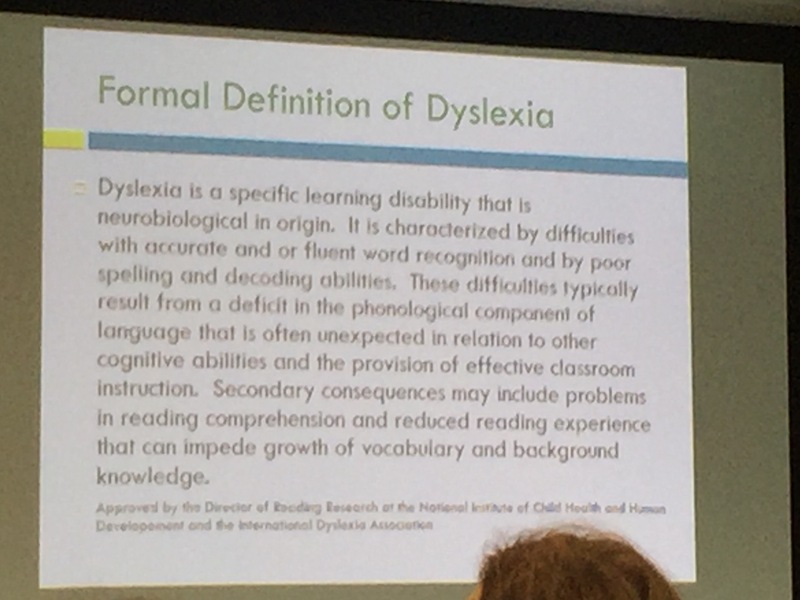 I attended a workshop today on Dyslexia and I seriously love going to professional development. There is so much wonderful and important information out there for people, especially teachers, to learn that I just wonder why I have not been doing this my whole career. This workshop really helped me see the light on some of the kids in my class and what is happening. It also made me realize there is so much more to Dyslexia than just seeing words backwards and writing them backwards. This quote they posted up was brilliant. 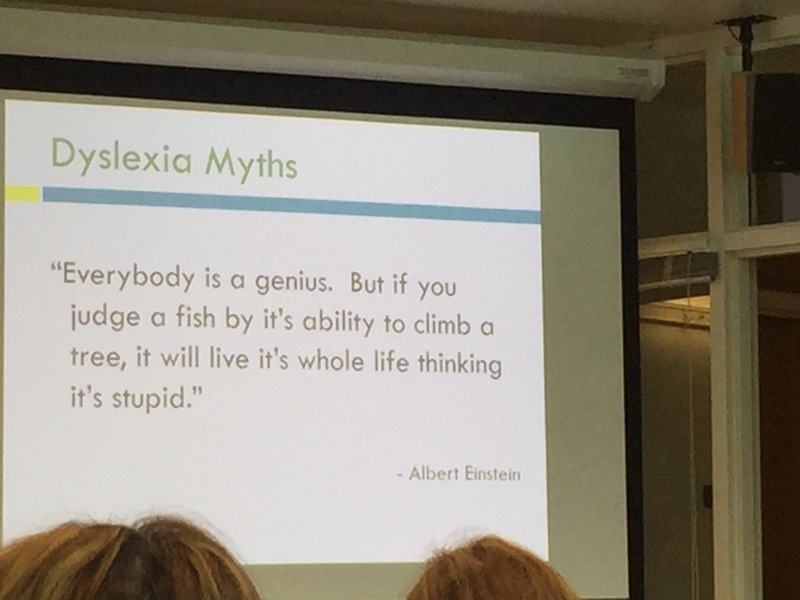 It was such a great quote because what they were saying with the quote was that kids with Dyslexia feel like they are stupid because they are terrible spellers, the have a hard time reading aloud and they have poor handwriting. So when they turn work in and you mark it up, writing all of the things they did wrong, they feel stupid. 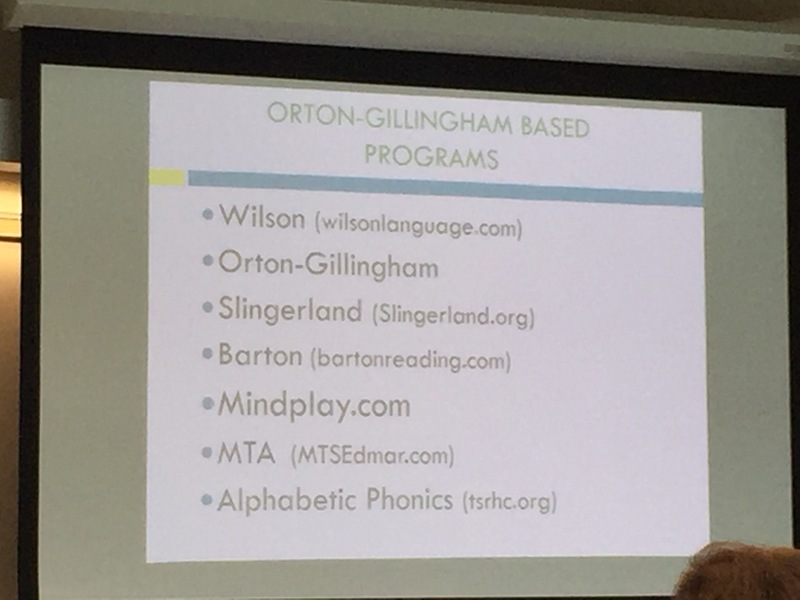 Another piece if information that I learned was that Dyslexic students memorize the words that they read because they cannot decode words like other readers, making spelling quizzes and learning how to spell nearly impossible. I 100% have a student like this in my class. 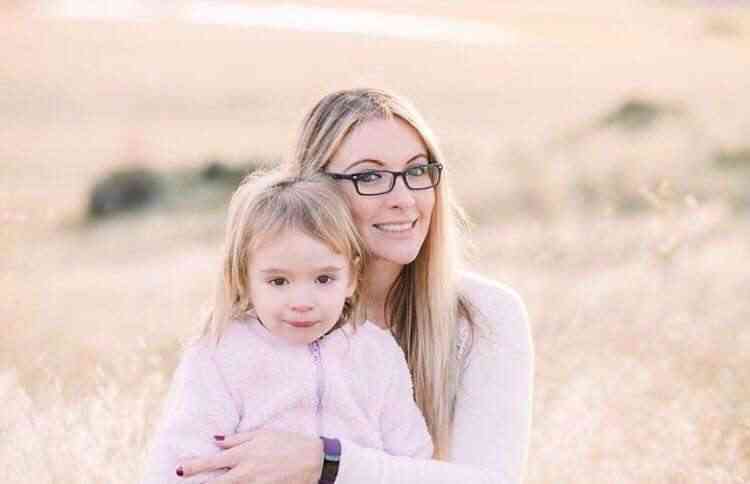 This was a great list of sites that can help your students or children – whether it be learning a new way to learn digraphs, prefixes and suffixes, or having speech to text. All huge resources. Teachers, I would recommend a workshop like this. It is very enlightening. It opened my eyes for signs to look for. That sounds great, it’s good to have a better understanding. ? It was a great workshop ! I survived school with dyslexia in the 60’s/70’s when the phenomenon was known but not often recognized (before “learning disorders” or now “learning differences” were well defined). I remember in second grade asking my teacher what the differences between “are”, “our”, and “hour” were in terms of spelling because all three words sounded the same to me. I never had my learning hurdle official address, but eventually developed a vast vocabularly by reading the Smithsonian Magazine out loud to myself while in highschool and college. I still cannot spell most of the words that I know, but I have learned tools for figuring out the spellings and verifying the I have the correct word. Later, in my profession work (occupational therapist working with adults and children who have neurological disorders) I learned about the effect of vision on comprehension. Many of us with dyslexia have ocular motor and convergence (focal distance) insufficiency issues. I literally “see” the first couple and last couple of letters of a word then fill in the middle to guess the word by context. That is, for me, because the middle of the word is a scamble of letters that make no sense in the sequence in which I see them. Of course, this can lead to amusing reading when the words which I guess are not actually those written. Thank you for sharing ! It must have been a tough learning environment not knowing how to learn the spelling of words and why everyone else could and you couldn’t. I can imagine the anxiety. They talked a lot about what you are saying. Very similar things. They also mentioned that Dyslexia causes brains to have a 3 dimensional mind which makes it a lot easier to work in hands on careers like dentistry etc.